"Until you become a mother you have no idea how much these words ring true. I have three beautiful children and with each child the love that I have as a mother simply grew. Pregnant with my second child I was nervous about my daughters birth. My son was 3 years old, so excited for his little sister to arrive and I was in a panic. How could I possibly love my second child as much as the first, would I always favor my son? But then the birth arrived and they placed her on my chest and all my worries melted away. In an instant my heart grew in ways I never thought possible. For me, every time I wear my ‘A Mother’s Love Necklace’ it represents that unique and special love I have between each one of my children." A Mother's Love necklace: the big stone represents the Mother and the smaller stones for all the loves in her life. 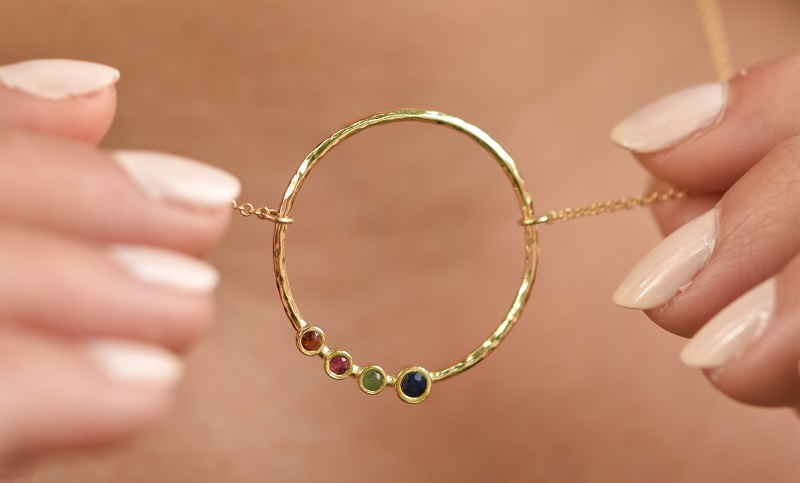 Place up to 7 small birthstones on this unique necklace, available in silver, 14k gold, 10k gold and gold plating.